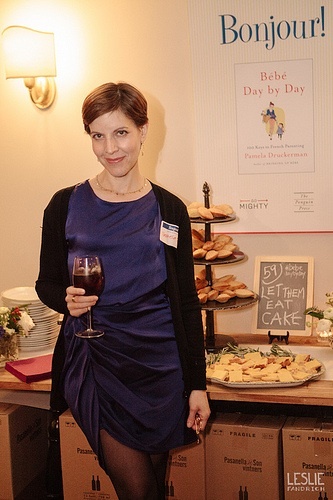 When we received an invitation to attend Pamela Druckerman’s launch party for her new book, “Bebe Day By Day,” I was ecstatic. The anticipated follow-up to “Bringing Up Bebe” offers 100 keys to French Parenting. This book intrigued me from the start because, well, I love France. There is also a nice French woman who lives in my building who has two really well mannered children, and the three of them are always stylin’. Seriously. Whenever I see them walking to school in the morning, I wonder if I’d just missed an impromptu runway show. Needless to say, I wanted to know more about the French way. “Bebe Day By Day” is a quick read (because parents are always on the go) in petite packaging. Pamela chronicles tips on parenting, courtesy of French lifestyle principles that she learned while living abroad. As she noticed this society of good sleepers, gourmet eaters, and calm parents, she set out to share their secrets with the rest of us. From pregnancy to relationships, she addresses it all. With witty and useful sections featuring “The Fetus Doesn’t Need Cheesecake” and “Don’t Solve A Crisis With A Cookie,” Druckerman offers a new (to us Americans) perspective on how to address the inevitable challenges of being a parent. The event was just as charming as the book. 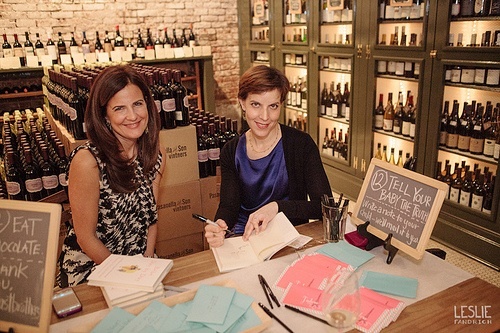 Hosted at Pasanella & Son in South Street Seaport, the launch was among glowing spirits. 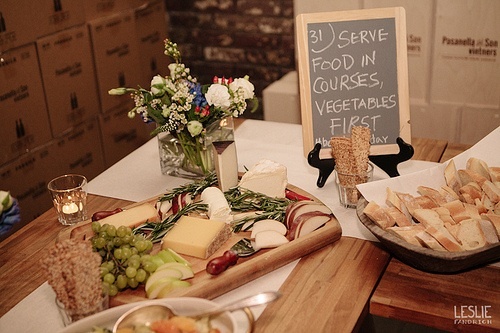 Delicious treats from Brooklyn Supper were complemented by chalkboards detailing keys from the book (e.g. “Make Evenings Adult Time” and “There are no ‘kid’ foods”). A really nice touch to the event was a table where you could take a moment to write a card to your child. I’m personally very big on the handwritten note for any reason at all, so I loved this. And of course, Pamela Druckerman’s delightful presence brought the whole celebration together. It was truly a wonderful night among newly made friends and delectable fare. Wash and core the apples (leave a bit of core at the bottom if you can). Put a knob of butter and a teaspoon of sugar in the center of each apple. Sprinkle same cinnamon over the top. Cook for 20-30 minutes, until the center of the apples melt. Remove the apples from the water. Serve them warm or cold. Sounds easy enough, right? Who says you need a ton of time to be gourmet? Bebe Day By Day is published by The Penguin Press and is available in bookstores everywhere for $19.95. I am so unbelievably jealous. I would have loved to have been at that event! Bringing Up Bebe was a wonderful book that all Americans should take more seriously! I didn’t even know another book was being released. Now I need to go pick up a copy, thanks!